The civil war in Syria has entered its fifth year. So far, with 210,000 dead and 10 million displaced, scattered to refugee camps or left to fend for themselves, the crisis seems overwhelming. "A lack of funding, coordination and international political will to guarantee aid access has meant that many people are not getting the help they need, particularly in hard-to-reach areas inside Syria," writes Justin Forsyth, CEO of Save the Children, for the New Statesman. Save the Children works in 120 countries: "Across all our work, we pursue several core values: accountability, ambition, collaboration, creativity and integrity." Forsyth offers specific recommendations including coalitions of governments and NGOs that can better coordinate aid, new strategies for reaching remote places, devising a system for nations to provide equitable funding, and empowering recipients. YaleGlobal points out that such strategies may "seem narrow in light of an expanding population, rising inequality, a decline in resources as basic as water amid so many longstanding conflicts." As is often the case, readers' comments to Forsyth's essay reflect the challenges and even awareness of the complexities in the Middle East. Some readers offer small and hopeful recommendations; others argue the conflict is not the West's concern. YaleGlobal concludes by noting that the crisis could destabilize neighboring countries. The globe has reason to provide aid. Yet polarization among nations and within nations and organization, in addition to unnecessary politicization of countless issues and misinformation, not only prevent efficient distribution of aid but also the good governance and united effort that could keep such conflicts at bay in the first place. The novel Allure of Deceit examines how charitable aid comes with an agenda by examining a foundation's work on the ground in Afghanistan. A director uses programs to investigate the death of her son and wife while villagers are astounded to be regarded as recipients of aid. In the end, most parties are aligned, but not without deceit. In the end, does aid from external sources help governments evade their responsibility? What kind of aid encourages responsibility? Priorities must be set. 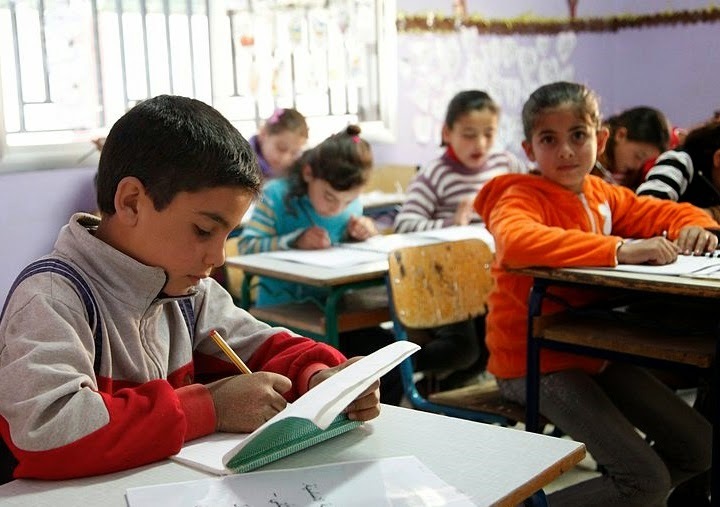 Photo of Syrian children studying in Lebanon schools, with aid from the UK, Save the Children, and Unicef, courtesy of Wikimedia Commons and Russell Watkins, Department for International Development.